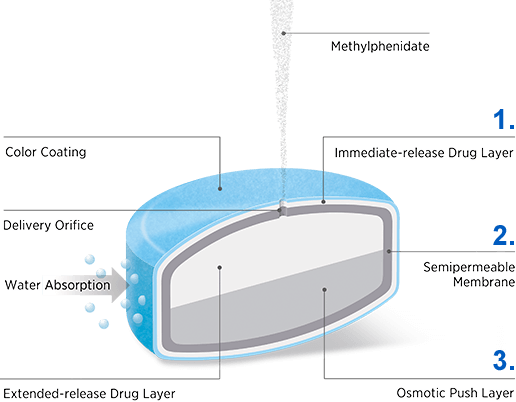 Some brand-name drugs have multiple generic competitors. As a result, the tablets may vary in appearance each time you fill your prescription. 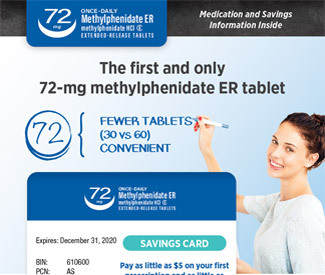 Methylphenidate ER 72-mg tablets are produced by only one manufacturer. This means you will receive the same light blue, round tablet every time you fill your prescription. In addition, Methylphenidate ER 72-mg was launched as a generic to help gain favorable coverage from insurance plans. Generic drugs go through a demanding review process to receive approval from the US Food and Drug Administration (FDA). The FDA ensures a generic medication provides equivalent safety and efficacy as the brand-name medicine. In 2014, the FDA revised its guidelines for all methylphenidate ER generics. Methylphenidate ER 72-mg tablets met these stricter guidelines to demonstrate equivalence to branded methylphenidate HCl extended-release tablets.